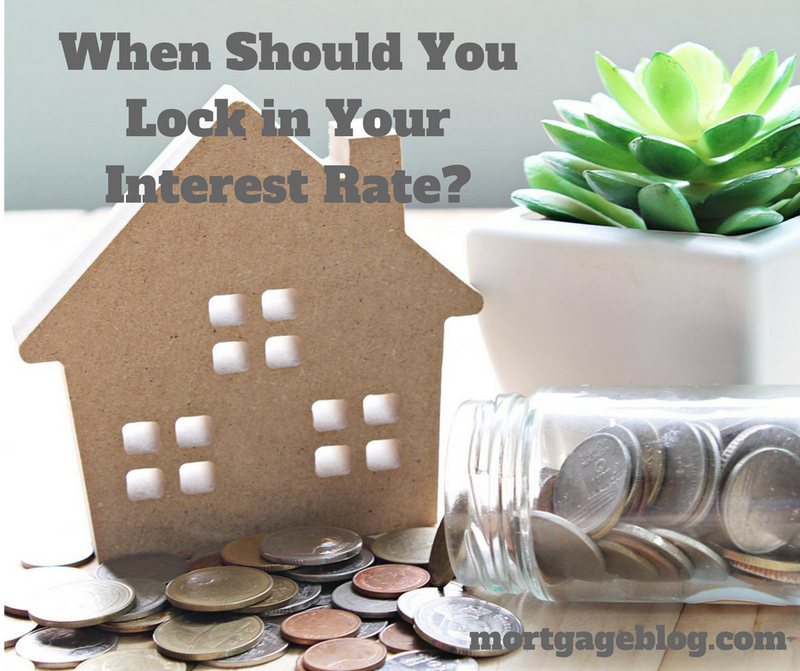 When Should You Lock in Your Mortgage Interest Rate? One of the first decisions home buyers are faced with during the mortgage process is knowing when it’s the right time to lock in an interest rate. The easy answer is when the rates are at their lowest – but when will that be? Or did you already miss it? Trying to answer this question and getting it right can drive you a little bit crazy. You can’t lock in an interest rate until you’re actually in contract to buy a home. Mortgage rates are as volatile as the stock market. Paying points is optional – you decide. The first fact above – you can’t lock in a rate until you’re in a contract – tells you when you CAN lock in a rate. Many homebuyers are under the misconception that the interest rate quotes they received from different lenders were set in stone. In reality, while it’s a good idea to get various quotes, so you have a sense of where rates are currently, you can’t lock in the rate. When you are in contract to buy a home, you can lock in an interest rate at any time before the final sign off by the underwriter. The final sign off is when the underwriter moves the loan file into ‘cleared to close’ status, signaling the loan decision is final. The interest rate must be locked in so the underwriter can calculate the debt-to-income ratio based on the actual interest rate. But should you wait this long to lock in the rate, even though it’s technically allowed? That takes us to the second fact about mortgage rates – they’re as volatile as the stock market and just as hard to predict. Mortgage rates move up and down at unpredictable intervals — an hour or even minutes. Even with large volumes of economic data and watching the market full time it’s little more than an educated gamble for mortgage professionals. The real question home buyers need to ask is “how much is one-eighth of a percent worth?” As interest rates rise and fall, lenders change loan pricing in increments of one-eighth of one percent. Rates can vary by one-eighth, one-quarter and, in rare occasions, even one-half of a percent. So, calculating how much one-eighth of a percent will mean to your monthly payment is critical. If you’re looking at a $900,000 house and you have a 20% downpayment, then whether you can lock in an interest rate at 4.5% or 4.625% (one-eighth higher) will make a $54 difference in your monthly payment. Double that amount for every one-eighth of a percent swing, up or down, and you can calculate how much you’re risking when you don’t lock in your rate (known as floating). Before we talk about the third fact about mortgage rates, let’s go over the important steps to locking in your interest rate. Locking in the rate is all about Risk. Before you lock in your rate, you’re taking all the risk that interest rates will increase while you’re floating. Once the rate is locked, the risk that rates will increase passes to the lender. If rates do increase before your loan closes, the lender will have to sell a loan that carries a lower rate. Transferring the risk to the lender when you lock in should be done in writing. The lender may have a specific form to do this with, but more than likely the process will be a phone call between you and the loan officer, followed by an email from you confirming you want the rate locked. Make sure you include the actual rate that you’re locking, any costs for the rate, also known as “discount points,” and length of the lock. The duration of the lock impacts pricing, due to the risk the lender takes on when you lock the rate. Lock durations are typically 15 days, 30 days, 45 days, 60 days. Locks less than 30 days are rare and risky to the home buyer because the rate lock can’t expire before the loan is funded. If it does, you’ll find yourself paying a fee to extend the rate. Make sure to discuss what an adequate lock duration would be for you, with your loan officer. If you do need an extension on your rate lock, the fees can vary based on several factors. The lender will typically extend a rate for 3-7 days for free, as a courtesy to you, if the delay was out of your control. Likewise, three-day extensions can be free regardless of the reason for the delay. Locks for 30 to 45 days are sometimes the same interest rate, and if that’s the case, take the longer lock period. Why have the added stress of worrying about the lock expiring? If you’re not scheduled to close for 60 days or more, work closely with your loan officer to decide when you should lock. While it’s your decision when to lock, if rates are stable it might be worth the risk to wait for 7-10 days into the contract period before you lock to avoid the lock expiring too soon. Most lenders have interest rates that won’t require you to pay a fee. But paying a fee means you will get a lower interest rate. It also works in reverse – taking a higher interest rate will mean a credit will be applied to your closing costs. Trying to decide if you should pay the fee or take the credit is answered by going back and assessing the difference one-eighth of a percent makes to your monthly payment. In the example above, one-eighth in rate meant a $54 difference in your monthly payment. So if you paid a fee to have the rate one-eighth lower, you would need to calculate how long it would take you to break-even on spending that money up front. If the cost for a lower rate on a $720,000 loan were three-eighths of a percent, or $2700, it would take four years before you would begin to benefit from paying for the lower rate. Rates Drop After You Lock – Now What? As much as you try to make the best decision when you lock in your interest rate, without a magic crystal ball you have no idea what’s going to happen to them tomorrow. Neither does the lender. However, if mortgage rates fall after you lock, you can still benefit. This sounds contrary to the whole concept of rate locks – so how does it work? Lenders call it “Floating Down,” and they have specific guidelines addressing the potential situation, and a specific calculation to go with it. It’s unlikely they will drop your rate to the lowest available, but generally, they will lower your rate as long as rates fall by a minimum of one-quarter of a percent. When that happens (which is rare within a 30-60 day period), the lender will usually ‘split the difference’ with you and lower your rate by one-eighth of a percent. Once you know all the details of your lenders’ rate lock policies, think seriously about locking in your interest rate as soon as possible. Make sure you take into consideration when your purchase is scheduled to close and choose a lock duration that won’t require you to pay for an extension. Above all — calculate the exact amount of savings you’ll have if you wait for the rate to drop by one-eighth so you know what you might gain – or lose!